OOh, this pink, purple and amethyst resin geode is SO sparkly. I used a lot of glitter bands in this piece and covered the entire surface with resin, rather than use any kind of textured finish. 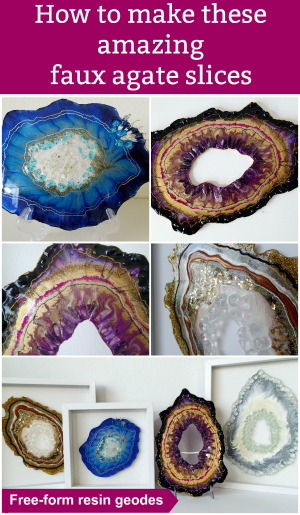 In the center of the geode are real amethyst gemstone chips. I was a little disappointed in the amethyst stones I received. In the advert they looked lovely and purple, but when my bag arrived, sorting them out into colors revealed very few were actually purple. There was a lot of what could only really be described as grey, and some were almost entirely clear. I even received some drilled ones with holes in which were clearly not supposed to be in there. These photos online can be so misleading. 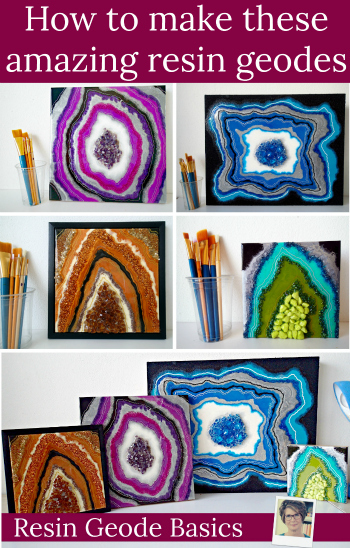 I picked out some of the better ones to use in this geode. I will use up the rest in other projects but because of their color, not make them the focus point I think. I posted some photos in one of the facebook chat groups of the finished piece and asked for people’s opinions on top coating. Should we, shouldn’t we? Pros and cons. The opinions came down about 50/50 either way. Because I hadn’t top coated before, I decided that I would do it on this piece. Although the end result is still stunning, looking back, I preferred it before the top coat, when there was a lot more texture. To me, that made it more interesting. The opinion was that a top coat made it looked ‘finished’, but unless there is a reason to do it in future, I think I’ll leave them with the texture of all the layers. What do you think on that? Top coat or not? Join me in my online class.